Since Saturday, we've been wondering if Nintendo really did cancel production on three of its new Skylanders-style Amiibo figures. Now, following a pair of vague statements from Nintendo, we've seen a more definitive answer. A GameStop source has shown us an internal message from the gaming retail giant that was sent to regional stores earlier this week. It mentions the arrival of wave 2 figures (Diddy Kong, Zelda and Little Mac), and it mentions that "the following wave 1 characters have been discontinued by Nintendo." 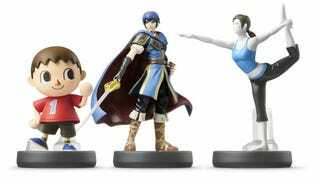 Those figures are Villager, Marth and the Wii Fit Trainer. Those are the same figures that a Canadian retailer said on Saturday had been discontinued. We've pointed out the obvious to Nintendo that neither of their statements actually answer the simple question we asked about the status of those Amiibos. This doesn't seem like a difficult question, so we're not sure why Nintendo is having trouble providing a clear answer. We've also reached out to GameStop for any further clarification on their end.